There aren't many signed 2009 Topps cards in my autograph album, but I added one more with this TTM success from Adam Lind. The card was out for a while, but it finally came back in, and looks great. Lind (b. 1983) played in the majors from 2006 to 2017 for the Blue Jays, Brewers, Mariners and Nationals. He had 1,247 hits, 200 home runs and a .272 batting average. He was a Silver Slugger Award winner in 2009. That was the only season where he received MVP votes; he finished 15th in the voting that season. 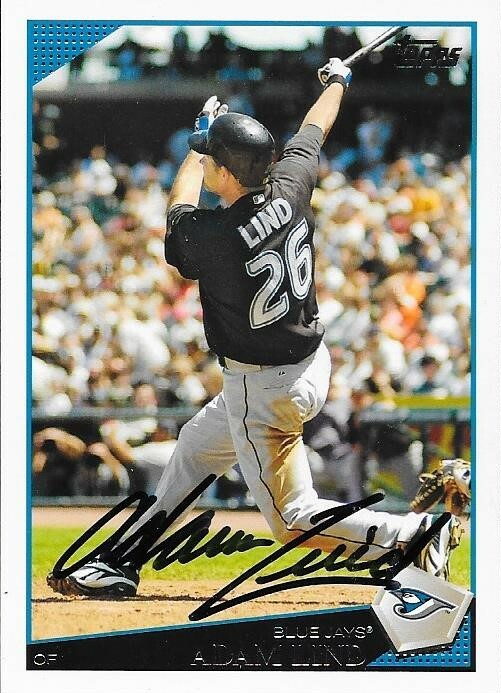 I mailed to Lind on February 22, 2018, and got the card back on January 18, 2019, for a 330-day TAT.